Fiction – paperback; Allen & Unwin; 288 pages; 2015. 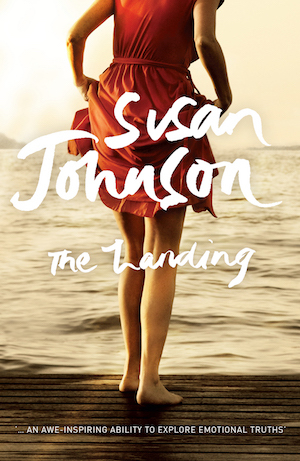 So begins Susan Johnson‘s The Landing, which tells the story of a well-to-do, good-looking 55-year-old man trying to recalibrate his life after his wife leaves him for a woman. Jonathan Lott is scared of being alone, but he can’t quite believe that his marriage is over. Seeking solitude — and a place to lick his wounds — he spends as much time as he can at the couple’s holiday home at The Landing, 150km north of Brisbane. But in this quiet lakeside community — with just a few streetlights, a couple of bitumen roads, no reticulated water or sewage and patchy mobile phone coverage — Jonathan’s comings and goings are witnessed (and commented upon) by the locals who live there. What results is a relatively lighthearted story that is essentially a comedy of manners — when is it socially acceptable to start dating again after you’ve separated, for instance — that focuses not just on Jonathan’s lacklustre love life but the lives and loves of pretty much everyone living in this rural backwater, including: Penny Collins, her demanding and elderly French mother Marie and her shallow and narcissistic daughter Scarlet; Sylv, who runs the only shop in town; Paul Raymond, who leaves his wife to shack up with the much younger Scarlet; Gordie, the Glaswegian doctor, and his pretty daughter Anna; and Giselle, a seven-year-old girl from an impoverished background who roams The Landing in search of company. The narrative comprises multiple, interleaved layers that to unpick it would be like peeling an onion. But the real strength of this novel lies in Johnson’s ability to capture the nitty-gritty of people’s lives, the often complicated relationships and tensions between different generations of the one family, and the complex nature of love in all its many forms — romantic, sexual and familial. The frailties of the human heart are captured with insight and delicacy, lifting this story from the bog standard romance the cover might suggest, to one that is full of nuance and humour and moments of pitch-perfect clarity. And all the characters, so richly drawn, feel intensely human. Combined with such eloquent writing — Johnson’s descriptions of the landscape and the wildlife that abounds in The Landing are particularly evocative and lyrical — makes for a superb, effortless read. I really enjoyed The Landing, but in the spirit of transparency should point out I know the author. Indeed, we had lunch together when she was en route to Paris to begin working on the edits of this novel. I ended up buying my copy when I went to Australia last year — and couldn’t wait to read it. For another take on this novel, please see Lisa’s review. Unfortunately The Landing hasn’t been published in the UK, but you can order a copy via the Book Depository. This is my 50th book for #ReadingAustralia2016 and my 33rd for #AWW2016. It must be time for another one novel from this author soon. I do like her work, though I like her early work best. I thought Life in Seven Mistakes was excellent and so was The Broken Book. I have a copy of The Broken Book and will read it in due course. I suspect Susan is working on another novel as I follow her on Instagram and she’s had a few trips to Greece, so wonder if that might be the setting for a new story? I’ve had a couple of ‘just the two of us’ Christmases and I must say I rather enjoyed them. We didn’t cook, we went to posh restaurants which of course we can’t afford to do if there’s a crowd. But it is nice to catch up with cherished family whenever you do it, I hope you have a great time in Abu Dhabi!